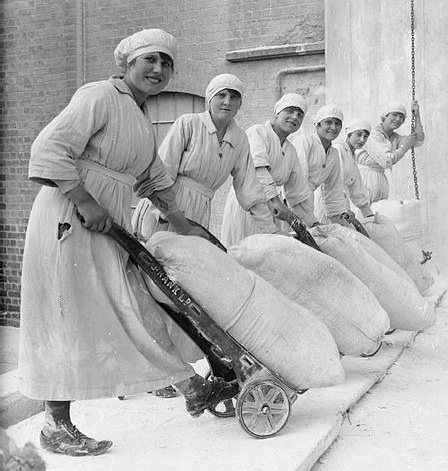 Female workers pose with trolleys laden with sacks of flour. Female workers pose with trolleys laden with sacks of flour in the grounds of the mills of Rank and Sons, Birkenhead, Cheshire, in September 1918, during the First World War. Image Industry during the First World War- Flour Mill Q28279.jpg is in the Public Domain and available on the Wikimedia Commons.